Unfortunately, most consumers ignore the Care Label when they buy clothing. Hence the question: should the dry cleaners clean them or will the washer at home clean them? Garment care labels should influence our purchasing decisions when it comes to shopping for clothing, and following the manufacturer’s instructions will ensure that clothing looks better and lasts longer — saving time and money. The Federal Trade Commission (FTC) Care Labeling Rule requires clothing manufacturers and importers to provide regular care instructions through the use of care labels. These care instructions provide six basic categories: washing, bleaching, drying, ironing, dry cleaning, and warnings. Labels provide written instructions such as “Machine wash or, Tumble dry”, but many manufacturers use graphic symbols in addition to the written instructions — a kind of shorthand for care techniques. The symbols and standards used in the United States vary from those used in Europe and other countries. Cleaners should answer all questions about labels. They work with labels on a daily basis and are very familiar with them. A reputable cleaner will answer any questions about the labeling as well as walk the customer through the process that they will use to clean the garment. Keep in mind, the garment manufacturer maintains the responsibility to provide the proper labeling. Many times imported fabric will have the proper label; however, paint, trim, beads, sequins, buttons, etc. are often added, and that will change the cleaning of the clothing. Experienced dry cleaners like Bibbentuckers can evaluate your garments and then provide the best method of cleaning. For instance, your wedding dress requires customized, special care. Bibbentuckers would hand-clean your special gown, reinforce the seams, and reattach any beads and other embellishments where needed. To prevent any damage to the fabric or its color, only environmentally safe solutions are used to clean the perspiration and other stains. In most cases, we can restore poorly preserved clothing by replacing missing fabric and ornamentation. Therefore, in many instances, successful restoration will occur to the article’s original beauty. 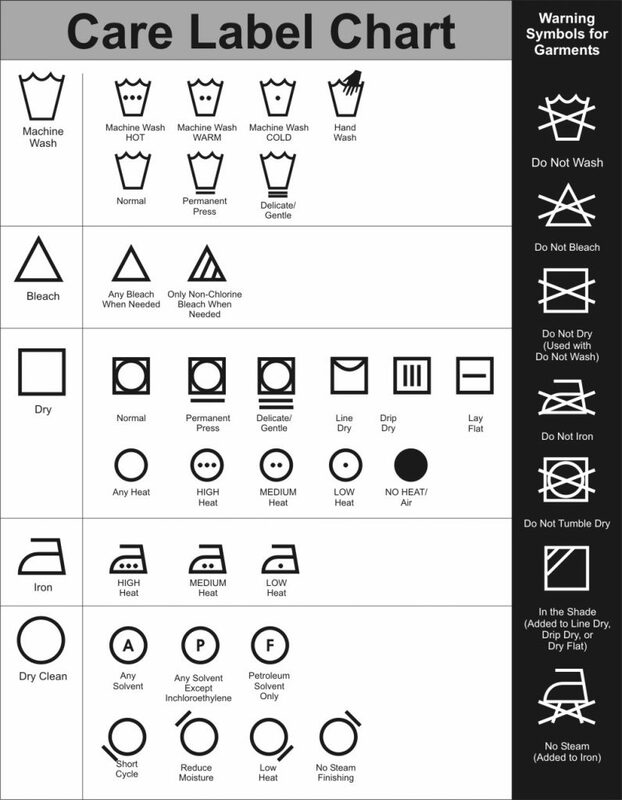 Finally, check out this handy garment care symbol chart from textileaffairs.com for more information.